An insight into an era dominated by temple builders on a tour that will unfold our ancient history dating back to 3600BC. During the morning we will be visiting the Hagar Qim Temple Complex which includes Hagar Qim and Mnajdra Temples. Before entering the temples we start at the new visitors centre where you can easily understand how these magnificent temples where built over 5000 years ago! We then continue with a tour of the Hagar Qim Temple. 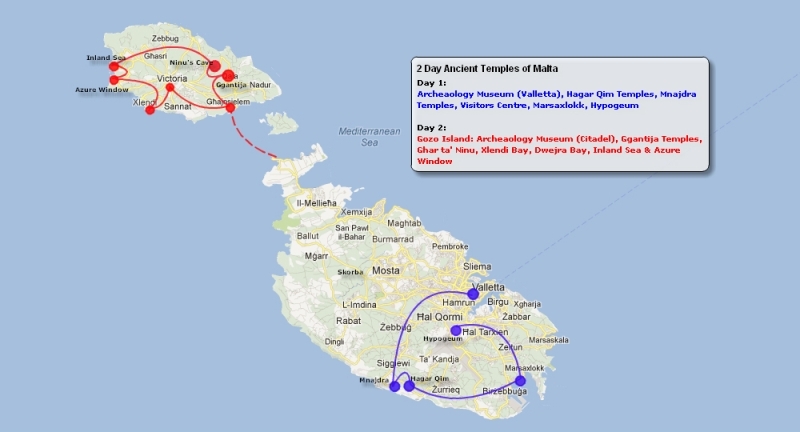 This temple has the largest and heaviest megaliths out of all the temple sites around the Maltese Islands, some slabs weighing a staggering 20 tons. We then make our way down to the Mnajdra Temple complex which entails a walk of around 500mts. This unique and impressive complex overlooks the tiny isle of Filfla. This site is probably the most atmospheric of all Malta’s temples and is also known as the Calendar in Stone because it marks the two Solstices and the two Equinoxes. We proceed with our tour passing the Blue Grotto (if time allows we may also have time for a boat trip to visit the grotto) and typical local villages until we reach the fishing village of Marsaxlokk. Here we will stop for a lunch break before continuing with our tour. In the afternoon we will visit two very important sites. Our first stop will be at the Tarxien Temples. Tarxien was the first temple site to be excavated scientifically and it offers a unique collection of circa. 3000 BC sanctuaries. Stone idols and tablets, domestic animals carved in relief, altars and screens decorated with spiral designs and other patterns, oracular chambers and riches enhance the attractions of these temples. Our final stop is at the UNESCO World Heritage Site Hal Saflieni Hypogeum. This unique, ancient underground monument is 12 metres below street level. It consists of a network of passages, chambers and caves cut on three levels, similar to the interior of an above-ground megalithic temple. An impressive part of the temple is the "Holy of Holies" and one of the most important prehistoric masterpieces known as the "Sleeping Lady" was also found here. 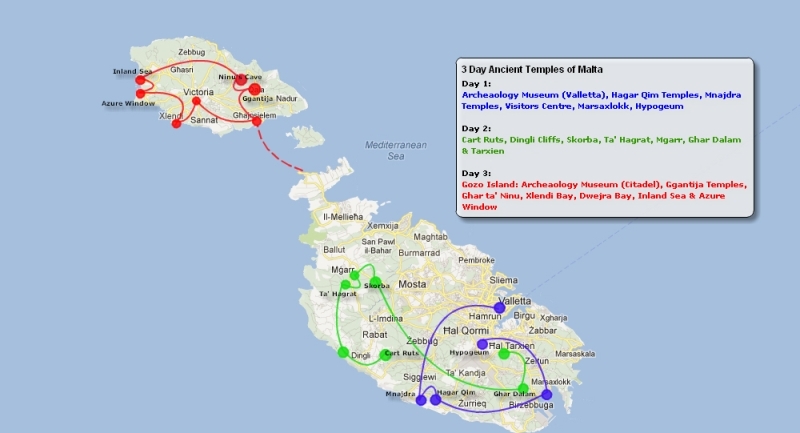 This two day tour includes the main temples and geological sites around Malta and Gozo. We start our tour with a visit to the Museum of Archaeology in Valletta. This museum displays an exceptional array of artefacts from Malta's unique prehistoric periods, starting with the first evidence of human settlement in the Ghar Dalam Phase (5200BC) all the way to the Phoenicians (700BC). We then proceed with a visit to the Hagar Qim Complex which includes Hagar Qim and Mnajdra Temples. Before entering the temples we start at the new visitors centre where you can easily understand how these magnificent temples where built over 5000 years ago! We then proceed on to Hagar Qim Temple. This temple has the largest and heaviest megaliths out of all the temple sites around the Maltese Islands, some slabs weighing a staggering 20 tons. A 500 metre walk down to the other complex of Mnajdra which is tucked away in the hillside overlooking the tiny isle of Filfla. This site is probably the most atmospheric of all Malta’s temples. Also known as the Calendar in Stone because both during the Solstices and the Equinoxes the interior of the temple is lit up. In the afternoon we will visit the UNESCO World Heritage Site Hal Saflieni Hypogeum. This unique,ancient underground monument is 12 metres below street level. It consists of a network of passages, chambers and caves cut on three levels, similar to the interior of a megalithic temple. An impressive part of the temple is the "Holy of Holies" and one of the most important prehistoric masterpieces known as the "Sleeping Lady" was also found here. On day two we will cross over to the island of Gozo. On arrival on the smaller island we start our tour with a visit to the Ggantija Temples and the impressive Visitor's Centre. 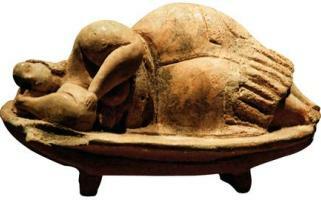 This centre exhibits all the artefacts from Ggantija temples and Xaghra Stone Circle, Gozo's Hypogeum. 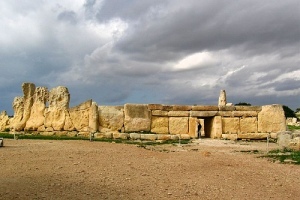 The Ggantija temples stand at the end of the Xagħra plateau, facing towards the south-east and date back to 3600BC which means they are older than the pyramids of Egypt. A drive to Calypso's Cave for the amazing view of Ramla Bay is next and then continuing along the north coast through Marsalforn, Qbajjar and Xwejni salt pans. Our next stop is at the Citadel where we will walk around this old fortified town and stop at the Grain Silos(closed on Sundays). After our lunch break in the pretty bay of Xlendi we continue onto Dwejra which is a natural site with spectacular views and famous landmarks including the Inland Sea, Dwejra Bay and General's Rock (Fungus Rock).